We both repair and replace shingle roofs in Alliston, ON, and with over 50 years of combined experience, you are assured of a quality result. There are plenty of new and amazing roof materials on the market these days, but there is a reason why shingle roofs are still the most prominent and chosen. They make sense from a financial standpoint. Often homeowners are wooed by the attraction of a costly roof replacement that will last 30+ years without realizing that not only do shingle roofs last as long as 25 years, but you could easily replace that shingle roof twice or even four times for the same approximate cost. Not only that, but statistics show that few homeowners remain in the same home for enough years to reap the benefits of a more costly roof. 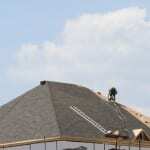 At Slippery Slope Roofing, we only install shingle roofs. We strongly believe they are the best option, even with the influx of all the newer products available. They are more affordable and have a lifetime sufficient for most every homeowner. In addition to that, there are also a number of improvements in recent years in the quality and appearance of shingle roofs. You might be surprised just how luxurious some of them are! If you would like to receive more information about shingle roofs and get a quote for the replacement of your aging roof, give us a call. We both repair and replace shingle roofs, and with over 50 years of combined experience, you are assured of a quality result. We work on one job at a time in order to provide you with dedicated attention during your Alliston, ON home’s roofing project. You just won’t find a better roofing contractor for honesty, experience and professionalism.